SL: I will use the Howard and Angus "Acoustics and Psychoacoustics" book as reference text. SL: I am back. It has been almost 2 months since we talked last. So you had ample time to study Chapter 1, Introduction to Sound, and we can now get to use what you learned or what refreshed your memory. Zollner, Zwicker, "Elektroakustik", 3. Auflage, Springer, 1993. It is an excellent book about electro-acoustic engineering fundamentals and I have not seen anything comparable to this German text book in English language. 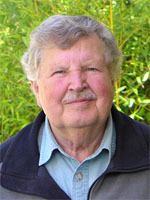 It is an update of Beranek's "Acoustics", where Mellow adds the modern computational expansion and reworking of problems to the classic reference written by Leo L. Beranek in 1954. In both books numbers and graphics are used to give meaning to formulas and their sensitivity to changes in parameters. Engineering always involves trade-offs and to strike a happy balance between different requirements. The difficulty in loudspeaker design is to understand how the ear/brain tolerates acoustic trade-offs. Unfortunately that cannot be found in either book. But I highly recommend both books to anyone seriously interested in loudspeaker design. Fitz: Both books require too much understanding of math. I am more experimentally oriented and trust my ears. Also a lot can be learned from discussions on the web. Besides, I know already what I want to build. SL: OK, then let's start by talking about your design. Since you called it #3 I will assume you built speakers before and have some experience. What information do you have about the drivers? Fitz: Here are the Spec Sheets for the Woofer and the Tweeter. SL: So you mount an 8" driver into a relative small box with about 8 liter internal volume. 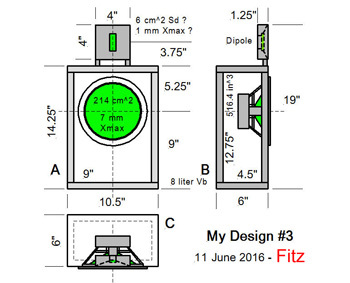 Fitz: Yes, because I want more bass output than the LXmini can get from its 5" driver. For the same cone displacement I should get roughly (8"/5")2 = 2.56 times or 8.2 dB more output because of the larger cone area. I also chose a sealed box, which means that the low end rolls off at 12 dB/oct. The LXmini has its -3 dB corner at 45 Hz. 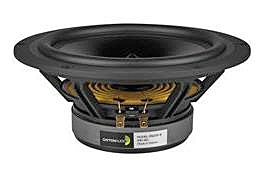 I could equalize the 8" woofer to have its -3 dB corner at (45 Hz) / [sqrt(2.56)] = 28 Hz and have the same maximum SPL at 28 Hz as the LXmini has at 45 Hz. 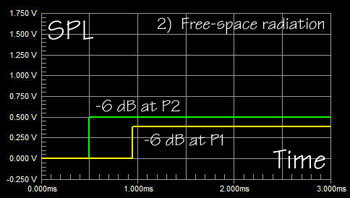 With DSP it is easy to extend and flatten the low frequency response. SL: That is certainly correct in principle, but lets look a bit more closely at the numbers. First of all, tell me why you chose a sealed enclosure of that particular shape and not a pipe like I used for the LXmini. Fitz: I do not like the looks and I am in agreement about that with my Domestic Manager, who does not want to see plumbing parts in our living room. SL: Did you see the Photo Gallery and what other LXmini builders have done about this? Fitz: Yeah, but I also want to try out my own ideas. SL: OK, then let's look at your box and woofer selections more closely, to see how they affect frequency response, how they radiate sound in 3D, how that affects what you hear in your room. Fitz: Fortunately I can get get close enough to that frequency value by reading from your table and interpolating between 10" and 17" for QWS. I conclude that the box is acoustically small below 250 Hz. SL: I understand, but I need to use some important formulas to tie your woofer electro-acoustically to your box. Fitz: What are you trying to tell me? Now filling the box with acoustic stuffing you lower Fb even further (but <18%) to around 50 Hz and bring Qb ideally down to 0.5 for optimal transient response of your woofer's 12 dB/octave highpass filter response. And you need no DSP to equalize the low end. Fitz: Thanks, increasing the volume is a useful suggestion. 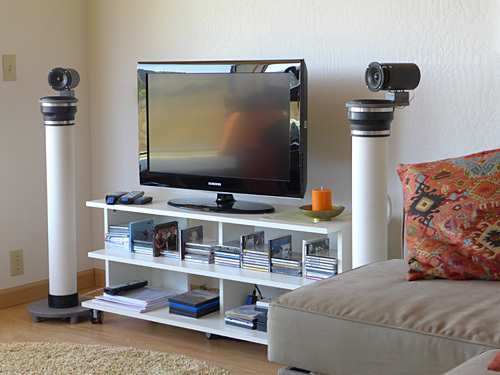 SL: You can learn more about woofer design from my Thor project and from the Loudspeaker System Design pages. Also, the LXmini low frequency response design is an evolution from the earlier Pluto design. In both cases I use a 4" ID pipe. Unfortunately pipes with exactly the same internal dimensions are often not available outside the USA. Fitz: So how much can you deviate from the original size dimensions? SL: I will use some mathematical approximations, which are useful in answering engineering questions, and which apply when a quantity x is much smaller than 1. The internal air volume of the pipe Vp increases as the internal diameter D squared and linearly with pipe length L.
This means that a 10% increase in pipe length L decreases the resonance frequency by 5%. A 10% increase in diameter D decreases the frequency by 10%. A 10% relative change corresponds to 20*log(1.1 / 1) = 0.83 dB. Hopefully Vp can be held to within 10% of the design value. Fitz: That should be helpful for LXmini builders and for my own estimations. But I have chosen a box where you chose a pipe. SL: Good that you chose a sealed box and not a vented box. 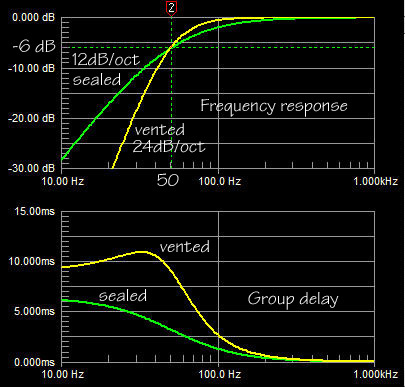 The graphs here show a comparison between between a sealed box with Qb = 0.5 and a vented box with the same 50 Hz, -6 dB corner frequency. In a vented box you add a second resonant structure, which is formed by the compliance of Vb and the air mass in the vent. The driver&Vb resonator and the Vb&vent resonator are coupled acoustically. Energy is transferred between them and used to extend the low frequency response, but at a steeper cut-off rate. The large amount of stored energy for the vented box is indicated by the group delay. It leads to ringing in the time domain and a characteristic bass sound. Probably 90% of all consumer and professional loudspeakers are vented. Thus this type of bass coloration has become the accepted norm and just because for a given box size the -3 dB corner can be pushed down further (increasing the group delay even more), than when a box is sealed. Bass quantity sells over quality. It's a male thing. 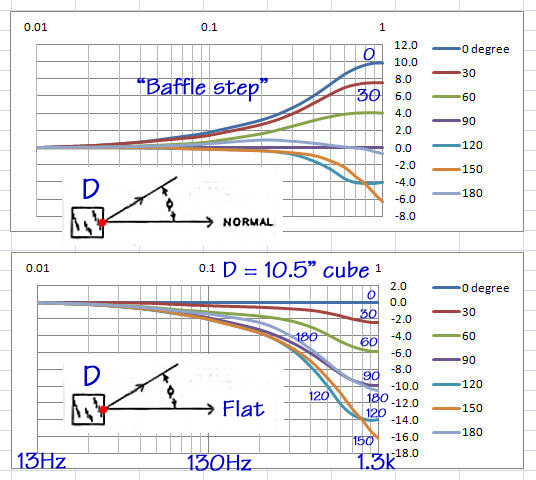 SL: Above 250 Hz, when your woofer box is no longer acoustically small, then acoustic matters become more complicated. Radiation from the driver in the box is no longer omni-directional. Below 250 Hz your woofer acts essentially like a point source, like a pulsating sphere and it is easy to predict the SPL, which it will generate in free-space at 1 m distance from the nomograph below. Fitz: Wow, this graph is like an analog computer and probably from a time before spreadsheets and computers. If I read it right, then it says that a 100 mm diameter piston with 3.5 mm Xmax will generate at 30 Hz an SPL of 70 dB at 1 m from the source. To get 100 dB SPL at 30 Hz would require a 1.8 liter peak-to-peak displacement. That would be obtained from a 400 mm piston with 7 mm Xmax. SL: That is correct, but keep in mind that this is free space SPL. For a woofer you always have a groundplane, which is acoustically close (<l/4) and you can safely add 6 dB to the SPL number. The woofer radiates only into half-space. 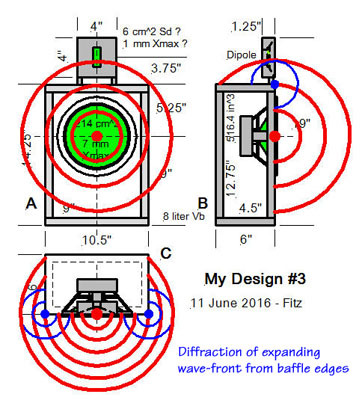 Fitz: I am amazed by the magnitude of the forces that a driver exerts upon the baffle into which it is mounted. SL: Yes, and those forces transmit a lot of vibration energy into the cabinet, which then flexes the cabinet walls at their vibration mode frequencies. 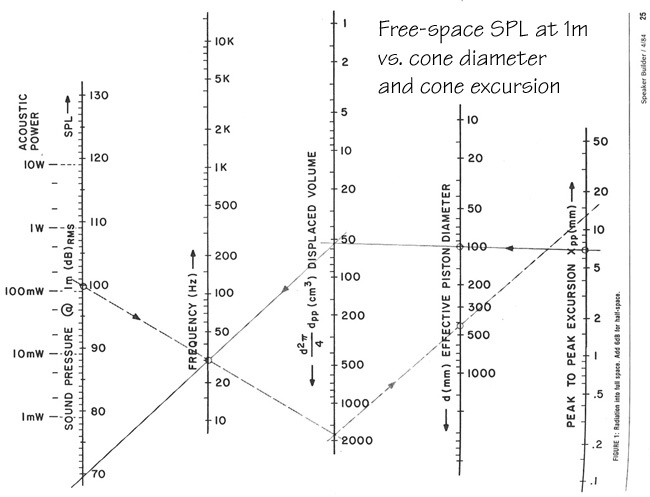 Small deflections over a large area can produce more sound output at certain resonance frequencies than comes originally from the driver cone. I have battled with spurious radiation from cabinets in my early speaker designs. The particularly nasty resonances are in the low hundred's of Hz. The only remedy was to make the cabinets extremely stiff. Using 3/4" plywood the unsupported panel areas between the braces must not be larger than 4" x 4". 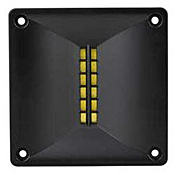 Panel vibration modes can occur when the panels are no longer acoustically small. 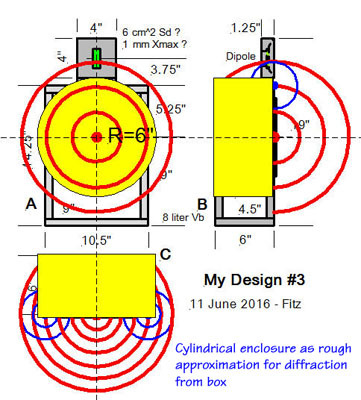 Fitz: So my cabinet might contribute delayed sound radiation at some midrange frequencies to the intended radiation from the driver's cone? SL: For sure. Knock on your cabinet. If it does not ping and hurt, then it is not stiff enough. Fitz: I guess that I should put a brace between front baffle and rear wall. SL: That will help. But there is more to do. The sound pressure inside the box will be enormous and also trying to vibrate the walls. 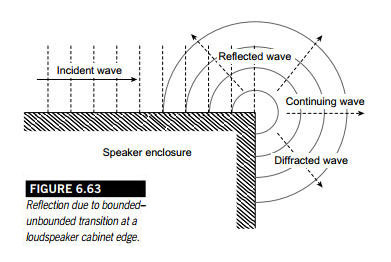 Furthermore there can be air borne resonances due to the internal dimensions of the cabinet. Stuffing the box with acoustic absorbent material is essential in order to attenuate resonances. Their sound is easily transmitted through the thin cone of your woofer driver. Fitz: I was going to add stuffing for sure. 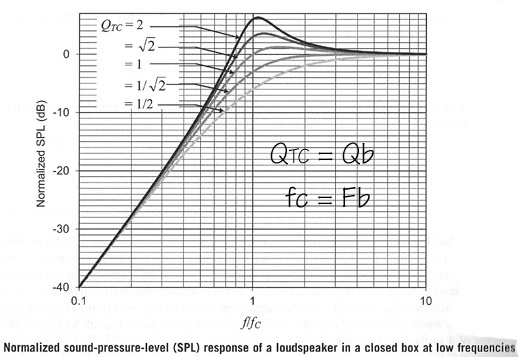 SL: Now let's look at the dimensions of the woofer box in terms of quarter-wavelengths. SL: Because when an object is less than a quarter wavelength in size, then a propagating sound goes around the object as if it was not there and very little is reflected from the object. I will explain in more detail how this works. Fitz: I see that you marked up my drawing with red ink and wrote down the frequency for which a dimension equals a quarter wavelength. SL: Look at the front baffle of the woofer box. The diagonal, the largest dimension of the baffle, is 17.7" and that equals a quarter wavelength at 192 Hz. Therefore, roughly speaking, the baffle is acoustically small below 200 Hz and your woofer driver will radiate unimpeded by the baffle into all directions, like a bare light bulb, which illuminates your room uniformly. Fitz: And what happens above 200 Hz? SL: That's where it gets interesting, because now the reflections from the edges of the baffle come into play. Assume for a moment that the front of your box is just a flat sheet of wood and that a point source is radiating from the center of your woofer's location on the sheet. The front of the radiated wave propagates like an expanding half-balloon until it hits the edge of the the box. As soon as the half-balloon goes over the edge the volume of air inside the balloon gets redistributed. The force, with which the balloon surface was expanding, drops to a lower value. The balloon surface becomes distorted. Fitz: Yes, I have read that when the wave comes to the cabinet edge and changes its direction of propagation in order to follow along the new surface, then that is like adding a new source at the edge. SL: It is like the incident wave comes to the edge and a new source is added, which now radiates in all directions, which are not bounded by the box surfaces. 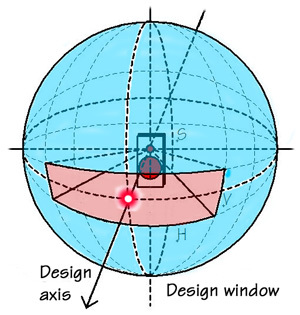 The superposition of the original wave with the wave generated from the edge describes the total radiated sound field. Fitz: The wave-front hits the 5.5" edges first and the 9" edge last. So there most be a lot of time smear between the secondary sources along all the edges. SL: Indeed, it is difficult to analyze the diffraction from a rectangular box. At this time my I just want to explain the fundamental principles, which come into play when we investigate diffraction effects. I will therefore use a 12" diameter solid cylinder of 6" height with an acoustic point source at the center to broadly simulate diffraction effects of your box. SL: First we need to talk about bounded radiation and free-space radiation, because real acoustic problems are usually a mixture of both. 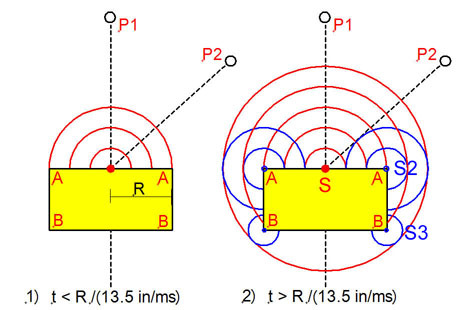 A woofer box interferes with free-space radiation from the woofer driver at higher frequencies but not at the lowest frequencies. And then there is the floor on which the woofer box sits. The floor stops the wave from expanding. SL: Assume that the point source S sends out a step in sound pressure and we observe its arrival at point P1 at distance d1, and which I will call a point "on-axis". Observation point P2 is off-axis and at distance d2. SL: Since d2 is less than d1 in our example, the step arrives at P2 first. When it gets to P1 the step is weaker by the ratio of (d2/d1). At a (d1/d2) greater distance the wave-front also has expanded sideways. 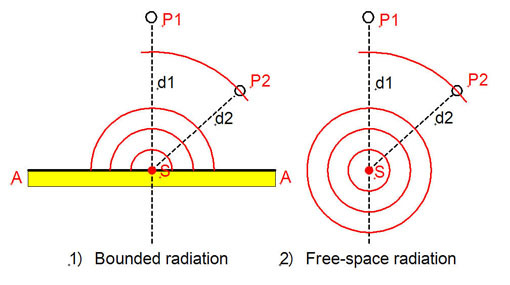 Radiation from the source on top of the infinite boundary can only expand into 1/2 the space as the unbounded source and will therefore have twice the sound pressure as the same source radiating into free space. Now let's look at radiation from the point source S on top of a solid cylinder. A step in sound pressure propagates out in all directions and along the surface until it comes to the edge of the cylinder after a time R/c. Added to the original wave is now the wave from a ring-source S2 due to a change in boundary. Since space has increased with the right turn of the boundary A-A into A-B the sound source S2 must cause a decrease in sound pressure. When the original wave reaches corner B, then a third ring source S3 is superimposed to the sound field. Fitz: I see that with R = 6" it takes 0.444 ms for the step to reach edge A. There a negative going step is generated due to diffraction. Added to the direct step you get the green response curve. 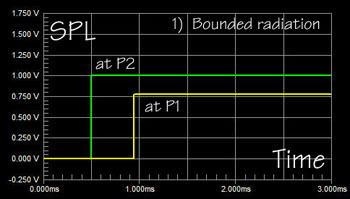 So at P1 I will see a step that goes to some amplitude "1" and then drops after 0.444 ms to amplitude "0.6". SL: Yes, and if the cylinder height A-B where close to zero, then the pressure would have dropped to "0.5". As it is now, there will be another step down (not shown) when the wave has reached B. From then on the SPl at P1 will continue to be 6 dB below its initial value. Now look at the frequency response at P1 assuming the source S sends out a sinewave of constant amplitude but changing in frequency from 10 Hz to 10 kHz. Look at the response for three cases. First A-A = infinite, i.e. a very large solid plane. Secondly, A-A = 12", the cylinder and thirdly, A-A = 0, or radiation from the point source into free-space. Fitz: So at low frequencies, below 100 Hz in the A-A = 12" case, the SPL at large distance from the circular baffle source will be 6 dB lower, than if the baffle extended to infinity. But as frequency increases the SPL goes up and reaches a peak at 1.13 kHz. That peak is even higher than if the baffle diameter were infinitely large. How can that be? SL: It has to do with the phase of the reflection at the circular edge A. 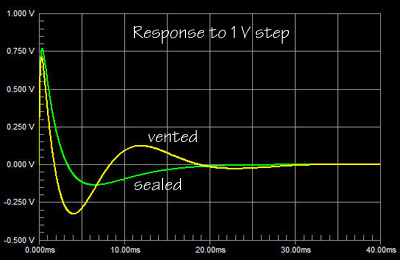 Look at the time domain presentation of step response and sinewave response for the 1.13 kHz and 200 Hz cases. Fitz: I see that the 0.444 ms delay for the diffraction due to R = 6" corresponds to half a wavelength or 180 degree of phase shift for a 1.13 kHz sinewave. Thus the diffracted wave now adds maximally to the direct wave. SL: And you can see how at 200 Hz the diffracted wave subtracts vectorially from the direct wave, because a 0.444 ms delay corresponds to only 32 degree of phase shift. Fitz: So, the lower the frequency, the stronger the diffracted wave subtracts from the source radiation. Diffraction is a side effect of acoustic radiation from a partially bounded space into a larger space. SL: Yes, but it could also be a smaller space. And actually, I have given you only a first order description of diffraction. I have used an electrical transmission line model to derive the on-axis, far-field, time and frequency responses for the case of a point source in the center of a disc with R = 6". The simple model ignores that the diffracted wave itself is diffracted again when it travels and encounters discontinuities in the boundary. And this second order diffraction will in turn cause third order diffraction effects and so on. Diffraction is complicated. Browse through the Loudspeaker Cabinet Diffraction paper, for example. In the book by Leo L. Beranek & Tim J. Mellow, "Acoustics - Sound Fields and Transducers", Academic Press, Elsevier, 2012, Tim Mellow has provided graphs of diffraction phenomena, which include higher order effects and not just point sources. 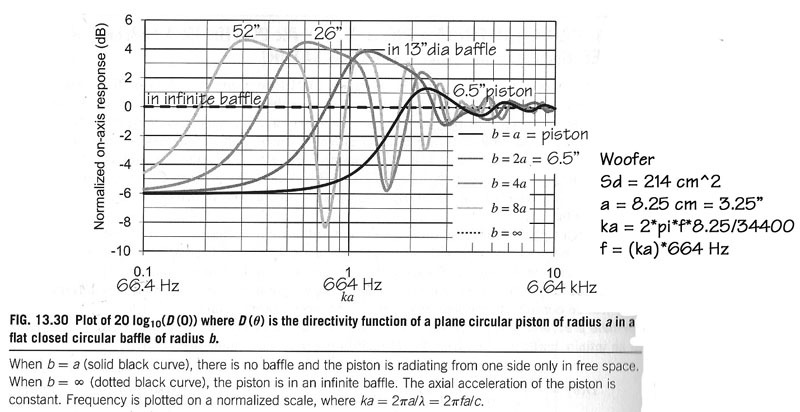 For example, taking your 8" Woofer but assuming for the moment that it acts like a 6.5" diameter piston source, then you can see its on-axis frequency response for different size baffles. I have denormalized ka for a radius of 3.25" so that you have actual frequency values and may appreciate the practical consequences of diffraction. 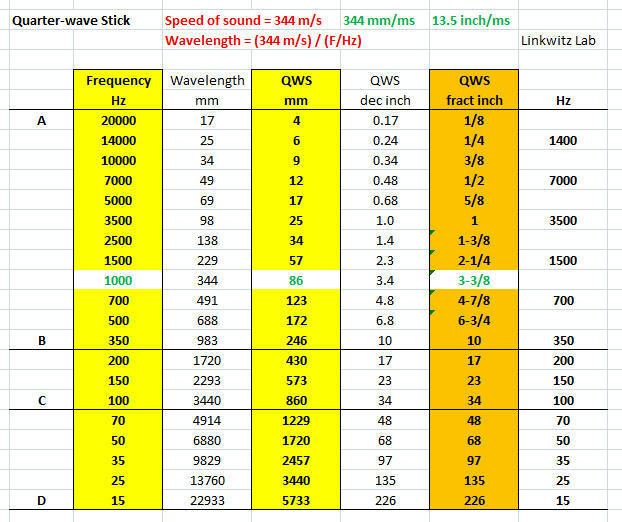 Fitz: I notice that all the curves go towards -6 dB at low frequencies and wiggle towards 0 dB at high frequencies. Also the first peak is quite broad. And the dips becomes less pronounced as the radius of the baffle decreases. The 6.5" piston acts more like a point source in the 52" baffle. SL: I have denormalized the frequency axis for the case where D = 10.5". I have then taken the square box with the point source on one surface and duplicated its response curves in a spreadsheet for the 0.01 to 1.0 range of D/lambda. Fitz: So the curves in the top graph are the same as for the Bell Labs cube? SL: Yes, as much as I could read them off of the original. You see that off-axis responses at 30, 60, 90, 120, 150 and 180 degree are all lower than the 0 degree on-axis response. The rising on-axis response is commonly called the "baffle step" response. Any respectable loudspeaker designer will equalize the response to flat. But then hearing the result may tip down the high end slightly and/or may add a small low frequency bump up. 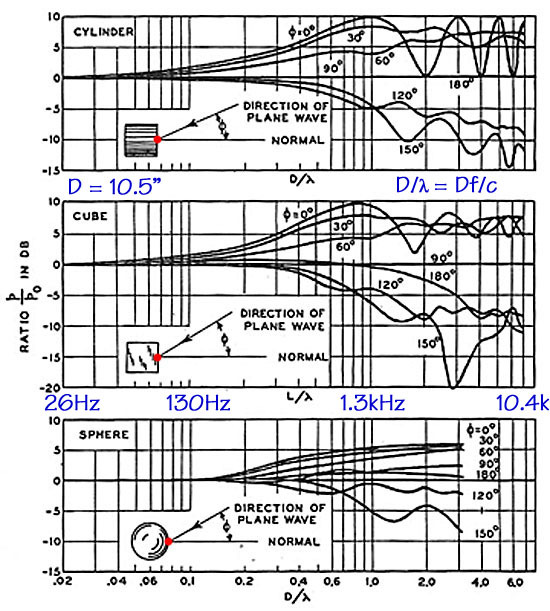 In my early days of box loudspeaker design I liked a -3 dB/decade down tilt from 20 Hz to 20 kHz. That gives a gradual and overall 9 dB decrease in a speaker's on-axis response from 20 Hz to 20 kHz. Movie theaters have a "House Curve" which drops the high end considerably. 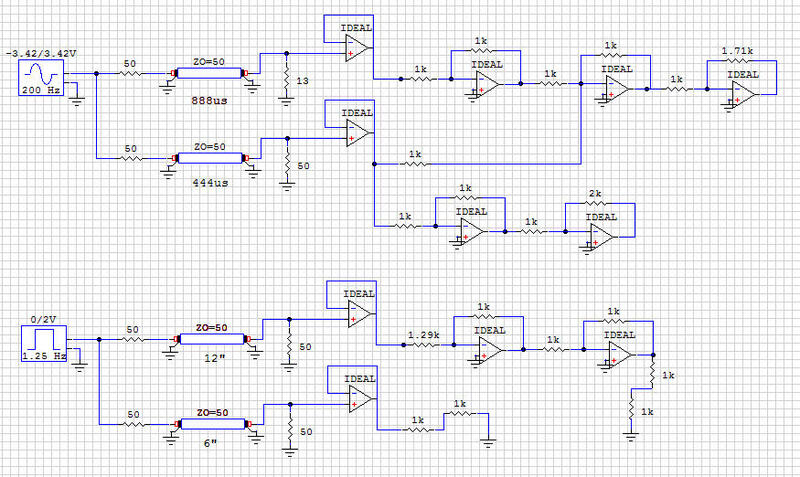 These days I design for plane flat on-axis response in conjunction with flat off-axis response, where the off-axis amplitude drops the same at all frequencies. SL: I side tracked. The lower of the two graphs above shows the off-axis frequency response when the on-axis response is equalized to be flat. Notice the similarity between 90 and 180 degree responses. Notice also that the 120 and 150 degree responses are lower than those. I would not necessarily have expected that. Now let's pick five frequencies: 13, 130, 390, 650, and 1.3 kHz, which corresresponds to D/l = 0.01, 0.1, 0.3, 0.5, and 1.0. For those frequencies I have plotted the SPL response as it would be observed from 0 degree to +180 and to -180 degree. The graph shows the polar response at the selected frequencies in x-y coordinates. Fitz: It looks that below 130 Hz the response from the point source on the cube is essentially omni-directional. And with increasing frequency the radiation becomes increasingly forward directed. But radiation to the rear and particularly at 180 degree is quite strong, though frequency dependent. SL: Yes, this "bright spot" at 1800 is due to the equality of the cube's surfaces, its edges and symmetry with the 00 axis. The point of all this diffraction discussion is that a source radiates in all directions and very much dependent upon its particular shape. The on-axis response is just one measure. A flat response on-axis is like a necessary but not at all sufficient condition for a loudspeaker's usefulness in a particular setup. 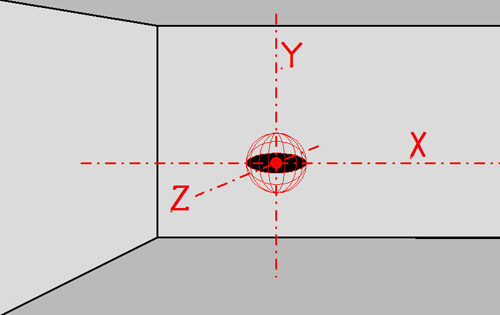 Many loudspeaker designers aim for smooth response over a window area of +/-V vertical degrees and +/-H horizontal degrees, but those angles are usually chosen far too small to tell a user how the speaker might sound in her room. She may sit on axis, in the "sweet spot", but even there it is most likely that more sound, more room reverberated sound energy gets into her ears than what comes directly from the speaker on the shortest path to her. Fitz: I appreciate how sound coming from all directions affects what I hear. I know the room is always a problem and I use absorbers and diffusers to make it dead. It works quite well in my experience. Problem is that the WAF is very low. SL: So you are aiming for a sound that I call "headphones at a distance". Fitz: What's wrong with that? SL: It has its place, like in a recording or mixing studio. But we will get to that later. 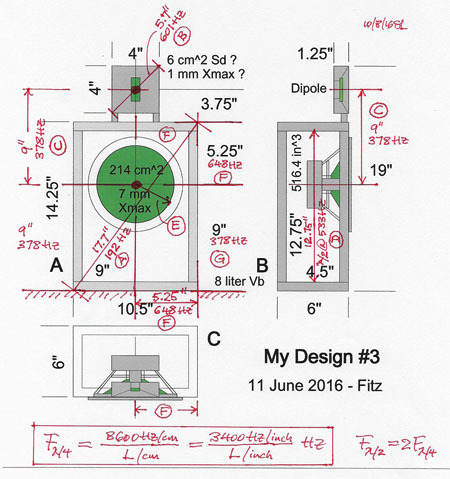 First I want to explain the LXmini woofer concept, Why and how it is different from your woofer in Design #3.